We work with our residents to provide a personalized level of service that matches their likes and dislikes, interests and hobbies. Our list of choices includes bible study and church services, musical programs, games, shopping events, crafts, and bus tours. 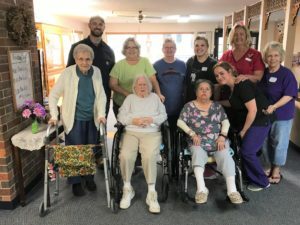 Our goal is to assist the resident in preserving the highest possible quality of life by meeting their physical, emotional and spiritual needs. For questions on individual services please contact our staff at 785-546-2211 or email us at cbailey@riverviewestatesks.com.